We've helped customers across Europe develop unique and themed playgrounds for their historic sites, tourist attractions and theme parks. If you've got a big playground idea, we can make it happen. Our modular and expandable UniPlay System is perfect for making large, themed, custom play units and our expert designers can provide themed spring toys, net play structures and other traditional products, with access to the entire PlayPower family of companies. This playground has been designed for the Glass House in Limmared, Sweden. 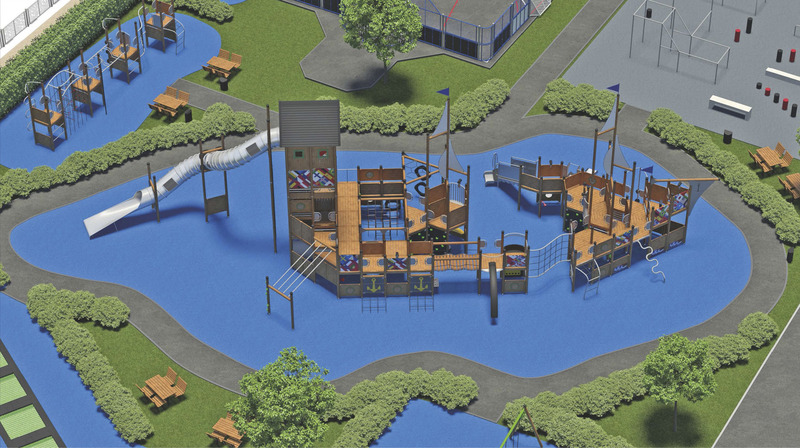 The central feature is a custom designed shipwreck, built from UniPlay components and featuring a huge tube slide as well as wheelchair accessible areas. Around the ship are benches and other play equipment including trampolines, swings and sports fascilities for football, basketball and parkour. This original wheelchair accessible pirate ship was designed for the City of Burgos in Spain. Since then our designers have re-imagined and re-used the structure for several playgrounds across Europe. This play area for Flong, Denmark includes a giant net play unit and several unique architectural pieces. Play Cubes, available in Steel or Plastic can make a big impact.